My Hubby has been a superstar the past couple of months. 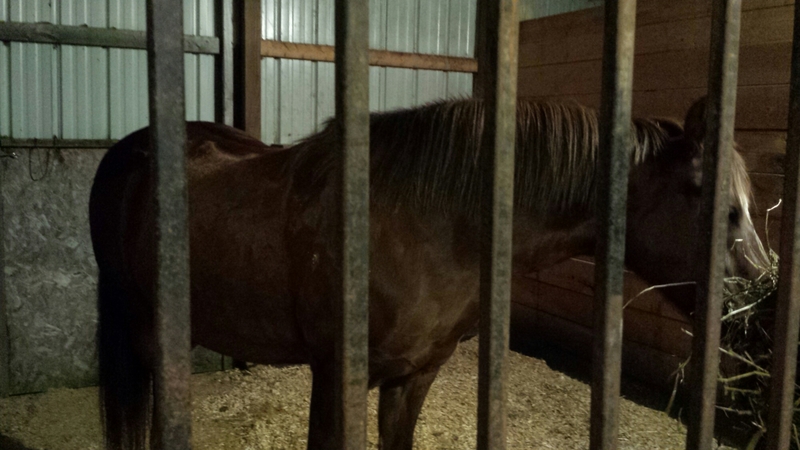 He’s rewired the entire barn, added outlets next to each stall, hooked up lights in each stall, and rewired the tack room with its own light and outlet. 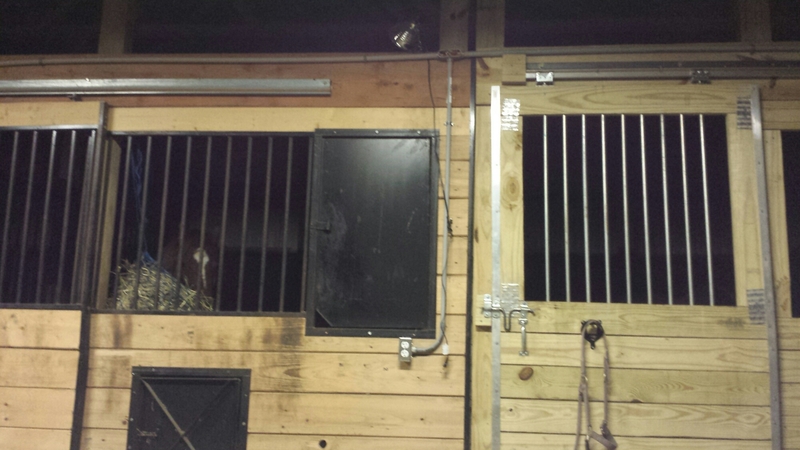 No more motion activated light in the tack room which convienently goes out 15 seconds after I walk in. Yay! We now have outlets to plug in the heated water buckets, and anything else I may need. Plus, he replaced the motion activated light on the back deck of the house with a regular light, and fixed the light over the barn door. 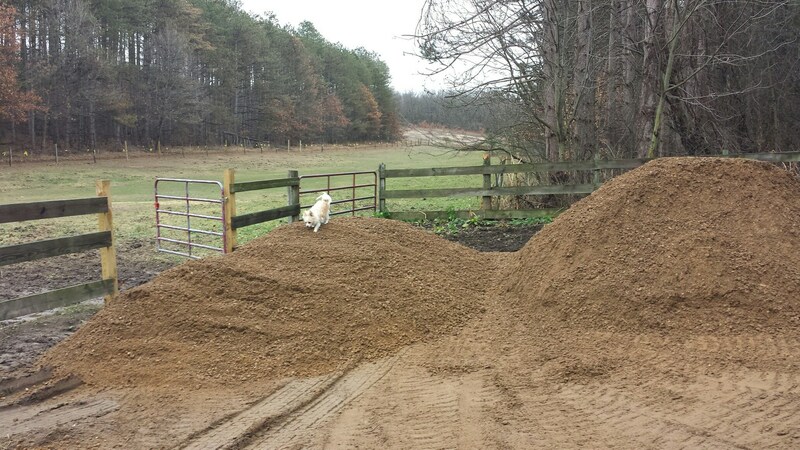 We also had gravel brought in yesterday to try to tame this bog pit of a paddock. Hubby took the fencing down to allow the dump trucks to access the paddock. You probably can’t tell from this picture, but the whole far side consists of a couple feet of the thickest, slimiest, nastiest muck I’ve ever seen. When it rains, the water just sits there turning it into a gooey mess. When it freezes, the muck turns into treacherous crevices and lumps. It’s rather ironic, really. The entire property is sand. Sand as deep as you can dig. Yet the paddock has the blackest, thickest muck I’ve ever seen outside of swamp land. The entrances to each stalls has at least a 2 foot drop from the stall to the paddock ground. We had 43 tons of gravel dropped off. At $5.60 a ton. Then we had to pay to have it delivered, which cost more than the gravel itself. Poor Hubby. They were supposed to deliver it at 8:30am, but they didn’t show up until 11 with the first load. Hubby had to call them to find out what was going on. They said they couldn’t find their driver! I’m pretty sure that’s not something you should tell a customer. Anyway, it was finally all delivered, no one got stuck, and the yard survived. This is Zeus approved gravel! Hubby spent the afternoon trying to spread the gravel out, but all we’ve got is a lawn mower with a little lawn mower sized blade on it, and some shovels and a rake. But… I’m really excited about this. I’ll be able to use the paddock as a paddock again! Yay! ← You will meet Jesus! 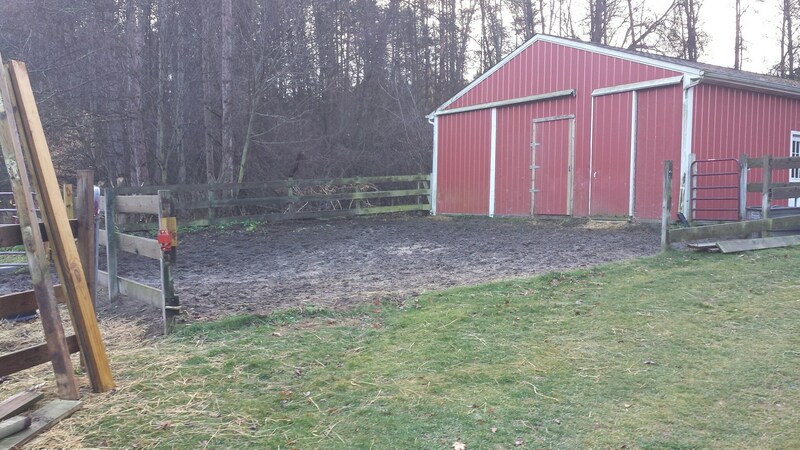 We just moved our horses to our own property and are fighting a slimy mud problem in several area – main one is the path from the barn to their turn out field, so I feel your pain! We live in Indiana and the property we purchased has very clay based land. Hope you get all your gravel spread and alleviate your mud issue! 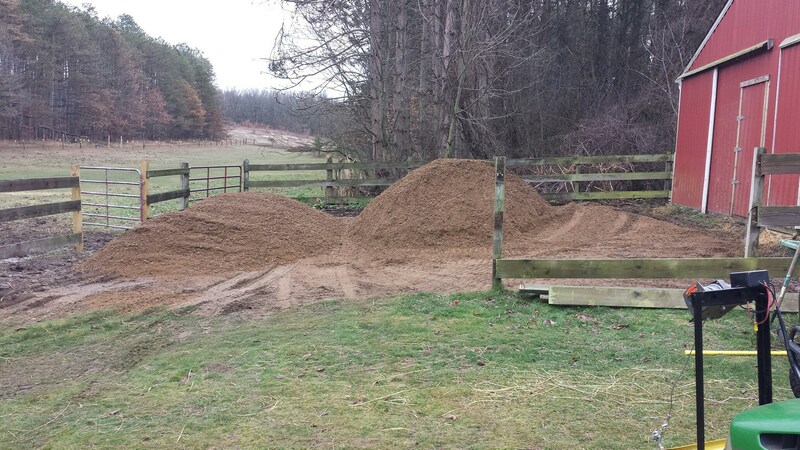 I’ve been wanting to get some gravel, too, in my paddock. But will NOT install until the ground his firm and dry again, increasing the odds of it actually remaining for a while and not getting sucked up into the ground. Let us know how this comes along with your project. How did you get it all spread out? I’ve noticed in the really boggy spots that the gravel is getting sucked up. Still better than the slop and sucking mud, but I’ll be kicking myself if it just churns into one giant muddy, stony mess. However, from what I’ve experienced, 1 foot of mud needs 1 foot of depth coverage of gravel, and even when installed on “hard” summer or spring ground, it does get ground into the ground and needs a refill every two years. Since I do not own my own place, I’ve been a bit reluctant to putting it in, but I have the feeling I’m there to stay for a while and may spring for it once the rains stop! Really want to you post about this again to let us know how it works out!